Position oven rack 4 inches from broiler element. Heat oven to 425°F. Spray 18x13-inch rimmed sheet pan with cooking spray. In pie plate or shallow dish, mix potatoes, 2 tablespoons of the melted butter and the salt. Spread potatoes in single layer on pan. Roast 20 minutes. Meanwhile, in same pie plate, mix 1 tablespoon of the melted butter and the asparagus; set aside. Stir potatoes on sheet pan, making room for asparagus and steak. Add asparagus to pan. In same pie plate, mix 2 tablespoons of the melted butter and the grill seasoning; add steak, and turn to coat. Add steak to pan, and pour any remaining butter mixture from pie plate over steak; roast 9 minutes. Remove pan from oven. Set oven control to broil. Turn steak. Meanwhile, in medium bowl, mix remaining 1 tablespoon melted butter, the tomato paste and mustard. Add shrimp; toss to coat. Add shrimp in single layer to pan around steak and potatoes, placing on top of vegetables as needed. 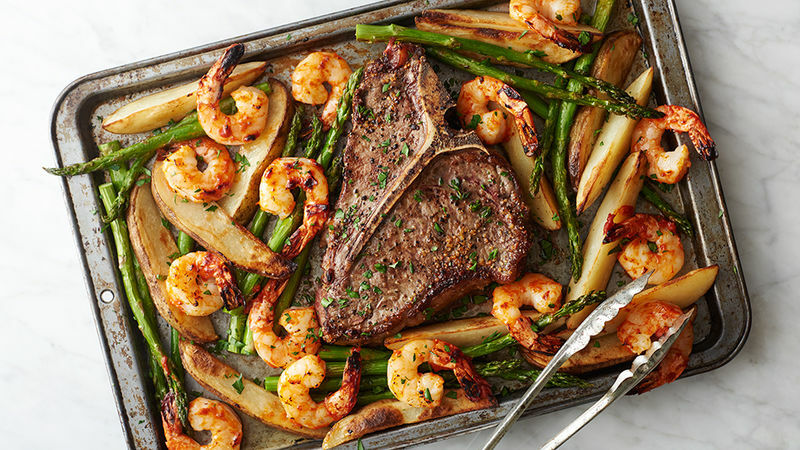 Broil 3 to 5 minutes or until shrimp are cooked through and steak is cooked to desired temperature (135°F for medium). Top with herbs. When possible, opt for larger asparagus spears. The bigger the shrimp, the more impressive the presentation. If possible, seek out shrimp cocktail-sized 16 to 20 shrimp per pound.